Philippine National Bank (PNB) was established on July 22, 1916 as a government-owned bank. After the Independence of the Philippines and until a new and separate central bank of the Philippines was established, PNB had a concurrent function as a central bank. After the Independence of the Philippines, PNB has kept developing as a National Bank in a strong collaboration with the government. The privatization started in 1989, and PNB was fully privatized in July 2007. On April 30, 2008, PNB announced merger plan with Allied Banking Corporation (ABC). On February 9, 2013, PNB and ABC were fully merged. New “Philippine National Bank” has become the 4th largest bank in the Philippines in terms of total branches (627 branches), total assets, deposits, and loans, and PNB has acquired even larger customer base. 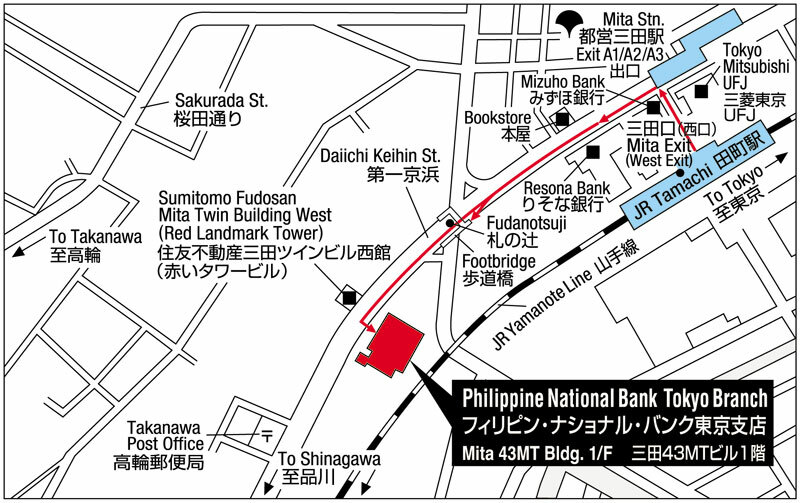 Philippine National Bank Tokyo Branch (PNB Tokyo) is the largest among overseas offices of PNB. PNB Tokyo started out as a representative office in Japan in September 1992, and on June 3, 1996, it was upgraded to the branch. In May 19, 2003, PNB Nagoya Sub-Branch was opened. PNB Tokyo has since then offered a wide range of banking services, not only as a medium for remittances for both Individual and Corporate clients, but also in housing loans. PNB Tokyo also accepts dollar and yen savings and time deposits. Now, PNB Tokyo and Nagoya is able to cater to a larger market for not only Filipinos but also to China, which started in 2009. PNB Tokyo provides language assistance in Chinese, Japanese, English and Tagalog. With 18 years experiences, PNB Tokyo in hand with PNB Nagoya is able to serve its valued clients with fast and easy remittance service at a reasonable fee, acquisition of housing loans etc. PNB Tokyo and Nagoya stands ready to serve. Please bring your valid original IDs with you when visiting our offices. Amend an implemented remittance, additional JPY2,500 will be charged as amendment fee. Please bring your valid original IDs with you. Banking hours: Monday to Friday 09:00-15:00, Sunday 10:00-15:00, Saturday and National Holidays are closed. Step 1: Mail your completed RMR and valid ID copy to PNB Tokyo. Fax is not accepted. 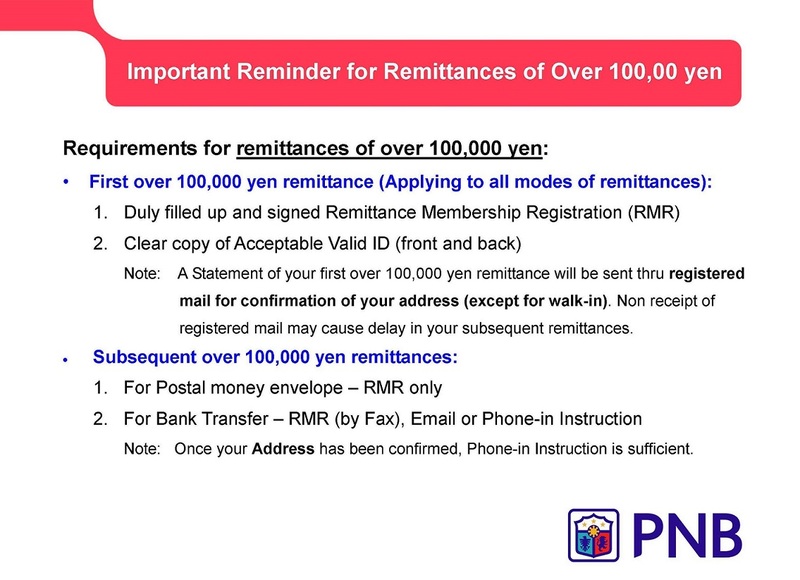 After processing your remittance, PNB Tokyo will mail remittance receipt and remitter ID to your registered address. Through mail, PNB Tokyo is confirming whether your address is true. It will impact your next remittance if the mail was returned to PNB Tokyo. Step 1: Only need to call and give your remittance instructions. If your residential address or visa status has been changed, please fax or mail PNB Tokyo your updated ID ahead. Step 2: Transfer your funds to PNB Tokyo’s above mentioned account. Step 1: Mail or fax your completed RMR and valid ID copy to PNB Tokyo. After processing your remittance, PNB Tokyo will mail remittance receipt to your registered address. PNB Tokyo has the right to suspend your remittance request and is not responsible for any delay caused by insufficient documents, incomplete remittance information, and/or the incompatibility of your instructed amount and the amount PNB Tokyo received, etc. In accordance with the Law for Prevention of Transfer of Criminal Proceeds (Japan AML Law), you may be required to submit information on Source of Funds. Q1: How many days will it take for beneficiary to receive remittance funds? A: It varies from beneficiary’s location and bank. Normally, it takes two to three banking days (excluding Saturday and Sunday). Q2: Without a bank account with PNB Tokyo can remitter still remit? A: yes, remitter can remit with PNB Tokyo through walk-in and bank transfer (ginko furikomi). For more details please check two modes of remittance. Q3: Are there any limitations for remittance amount? A: No, there is no limitation. However, in accordance with Japan AML Law, you may be required to submit information on Source of Funds. Q4: What is the function of “Remitter ID Number”? A: After your first remittance PNB Tokyo will issue you a Remitter ID Number. Thereafter when you remit or follow up your remittance status, please refer PNB Tokyo your Remitter ID Number in order to quickly and smoothly accomplish your transaction or inquiry.